Intended Parent from Blois, France. We are looking for a healthy surrogate mother and who are looking for a passionate woman to join us for this adventure to become parents.We would love to find someone we can connect with and wants to be part of our life.We appreciate your consideration and would love to journey with you in transforming our dream into a reality. Nous recherchons une gestatrice en bonne santé et une femme passionnée pour nous rejoindre dans cette aventure pour devenir des parents.Nous aimerions trouver quelqu'un avec qui nous pouvons avoir des points de connexion et qui accepte de faire partie de notre vie à travers ce long chemin.Nous apprécions votre intérêt pour transformer notre rêve en réalité. We are a gay couple from France and looking to become dads.We both are 36 years old and have stable jobs.We have a lovely house located in the center of France.We have been together for 12 years.We are healthy couple.We like gardening, runing, reading books and cinema. 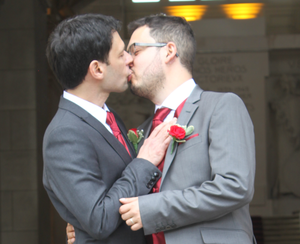 Nous sommes un couple gay, nous habitons en France et nous cherchons à devenir papas.Nous avons tous les deux, 36 ans et avons des emplois stables.Nous avons une belle maison située dans le centre de la France.Nous sommes ensemble depuis 12 ans.Nous sommes en bonne santé.Nous aimons le jardinage, la course à pied, la lecture et le cinéma. Dear Christophe, I would be very glad to become your surrogate mother if you are still looking for one. I am ready to carry a baby for a special person wishing to welcome a little angel and start a family. I will be looking forward to your message, wishing a beautiful day. Katarina. Hello - I am a hopeful surrogate in Seattle, WA, USA. I see you prefer a Canadian surrogate and someone who has her own children and all though I am not either of those, I think I have a lot of qualities you would appreciate. I've had a full psychological evaluation for surrogacy and am not looking for any financial compensation. Aussi, je parle francais (un peu). :) I hope to hear from you soon. I am ready for you to become a surrogate mother. Hello. I'm looking for responsible parents. I want to become a surrogate. I live in Moscow. Please look at my profile and it's interesting for me to discuss the details in detail. I will be happy to help you. Good luck with your search It's great that you decided to become a parents , children are happiness! Yes, I am ready for you to become a surrogate mother. My name is Katya, I'm 33 years old, I'm not married, I have two children. I can move to your country for a pregnancy program only with my children, I can not leave them and go to you for a long time.